Gaspari Nutrition Detonate XT Review – Does it work? Ever wondered what you’d get when you cross a fat burner with a pre-workout supplement? That’s what Gaspari Nutrition tries to accomplish with Detonate XT. Detonate XT contains both fat-burning ingredients and stimulants that supposedly gives users a nice boost in energy. Gaspari Nutrition attempts to break the mold by creating a unique combination of ingredients based on the common stacks used by people who purchase both fat burners and pre-workout supplements. Detonate XT claims that it gives users a clean boost in energy that enables them to do longer, more intense workouts. Although the ingredients are quite common in the supplement industry, it’s rare for a stack to be created by combining the two main ingredients Garcinia Cambogia and Caffeine. Garcinia Cambogia is currently the best-selling diet supplement today. Its main component is Hydroxycitric Acid (HCA) which is thought to have appetite suppressant components. HCA also inhibits citric lyase, which is the enzyme responsible for storing fat. Instead of storing fat, HCA converts it into usable energy for the body, which is important to endure longer, more intense workouts. 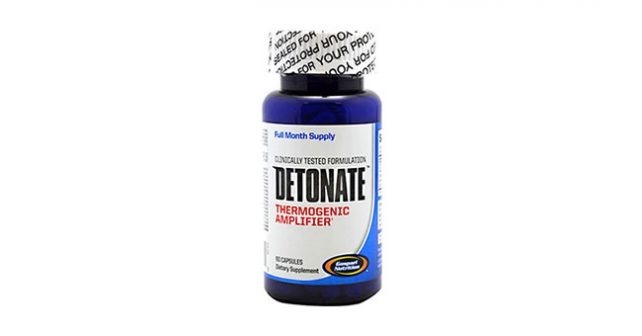 Detonate XT is typically used by people who undergo a cutting phase in their workouts. Instead of taking two different products, it is conveniently included in just one pill. Some users purchase two separate products to achieve their pre-workout energy, and Detonate XT claims to provide both benefits in just one pill. We sent samples of Detonate XT to the lab for analysis. We learned that Detonate XT contains 60% hydroxycitric acid, as it claims. It also contains a good amount of Caffeine at 150mg, which is roughly equivalent to a coffee grande at Starbucks. It appears that the main stimulant of the stack is caffeine, as no other stimulant is seen on the mix. It contains about 180mg proprietary blend which contains Yohimbe, a vasodilator with thermogenic properties. All in all, it appears that the mix could work, since Garcinia Cambogia, Caffeine, and Yohimbe can work hand-in-hand to give a nice boost to energy and metabolism. The stack could work, but there’s a good reason why you don’t see this kind of stack with other fat burners. People who undergo a cutting phase drastically limit their food intake, which means that there’s little energy to convert from the user’s diet, thus nullifying the effects of Garcinia Cambogia. Altogether, taking Detonate XT is roughly the equivalent of drinking two cups of instant coffee before workout, which you can enjoy without having to take a supplement. The pill delivery system is quite unremarkable. It may irritate the stomach since the pill doesn’t have an enteric coating. It also means that the contents could be easily broken down in the stomach, which could leave about 70% of the content to be absorbed through the bloodstream. Lastly, we were able to track down several Detonate XT reviews. About 60% of the reviews we encountered are generally favorable, but about 20% are displeased with the effects of Detonate XT, saying that the stimulants are too mild to be felt, and the appetite suppressant benefits are virtually nonexistent. Based on these ingredients, Detonate XT appears to be a feel-good, pre-workout supplement given its velvet bean extract, sceletium tortuosum, and citrus aurantium content. It’s more of a pre-workout supplement that’s trying to cross over to the fat-burning market with its garcinia cambogia content. The combination of two popular ingredients would have been awesome if it met the preference of its target market. It appears that Gaspari Nutrition needs to learn the difference between a diet pill, and a fat burner. Those are two different things. Garcinia Cambogia is an extremely effective diet pill, but it’s not a fat burner. It inhibits fat deposits and converts it into energy before it gets turned into fat. It has no fat burning properties whatsoever. If you want an expertly-formulated Garcinia Cambogia, check out Garcinia X. Garcinia X is one of the best diet supplements in the market today, and it has the stats, the studies, and the reviews to back up its claim.